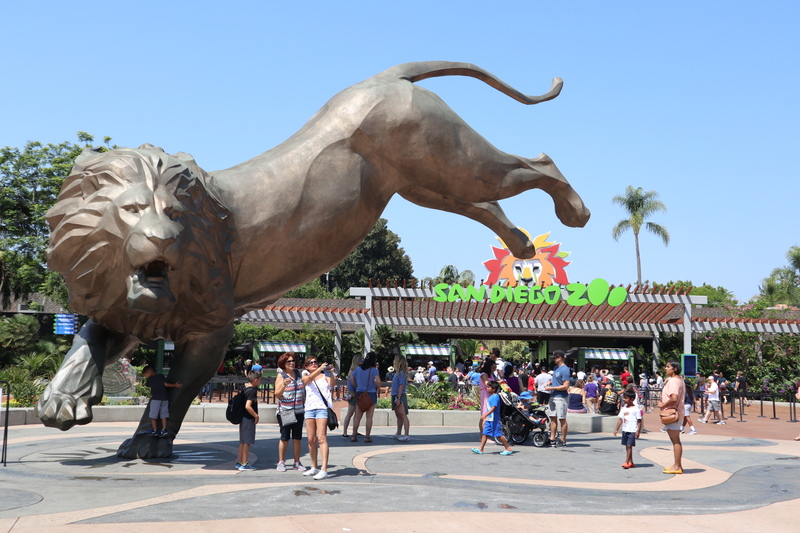 A visit to San Diego isn’t complete unless you make a trip to their popular and famous San Diego Zoo. The San Diego Zoo, residing in Balboa Park, houses over 3700 animals of more than 650 species and subspecies. Did you know that it is one of the largest conservation zoos in North America? In fact, according to one of the tour guides at the zoo, they spend over $10,000 a week feeding all the animals at the zoo! We visited the San Diego Zoo today, and originally had only scheduled to be there for 2-3 hours, however ended up there for over 5 hours. If you are coming with a family, be prepared for a full day for the visit. 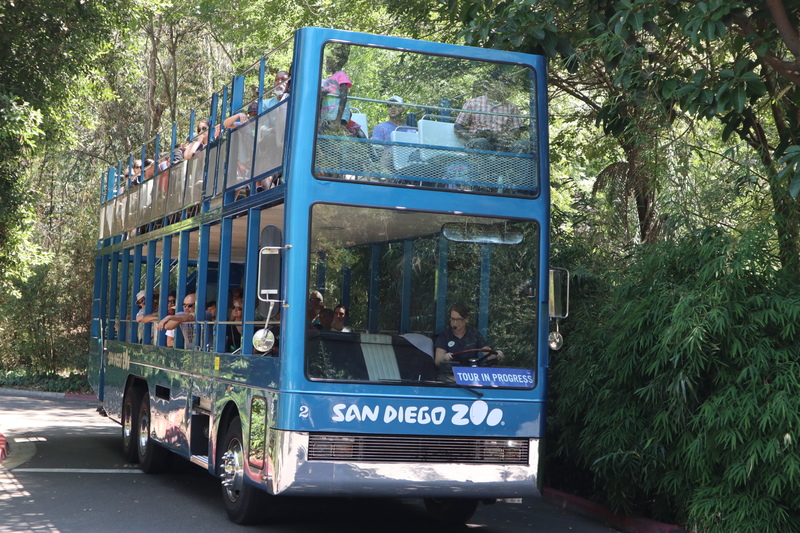 This zoo is really big, offering various modes of transportation around the park including stroller and wheelchair rentals, complimentary guided bus tours (with 1-day pass admission), aerial tram called Skyfari, and a hop on-hop off Kangaroo bus system to save your feet through the vast size of the zoo. Panda Trek – visit the giant pandas! 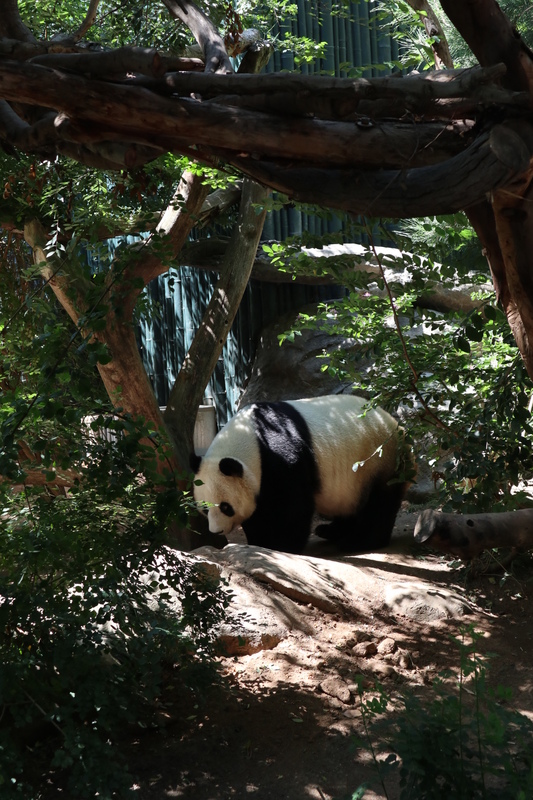 San Diego Zoo is one of the most successful North American zoos in panda reproduction. Panda mama Bai Yun is currently housed with Gao Gao in the research to continue panda breeding, including the latest bred panda, Xiao Liwu (Little Present). Xiao Liwu and Bai Yun are the two pandas that come out and greet visitors. Expect longer wait times during peak season as everyone loves to visit the pandas! During the hotter times of the day, Bai Yun and Xiao Liwu may not be outside, as they are staying nice and cool in their air conditioned rooms instead. Africa Rocks is a newer exhibit, only finished in 2017, to exhibit the biodiversity of Africa, including the African penguins, leopard sharks, vervet monkeys, Madagascar lemurs, and more! I loved watching the penguins diving into the water, swimming around and interacting with its viewers under the water, swimming and chasing each other and moving as people’s hands moved along the glass. 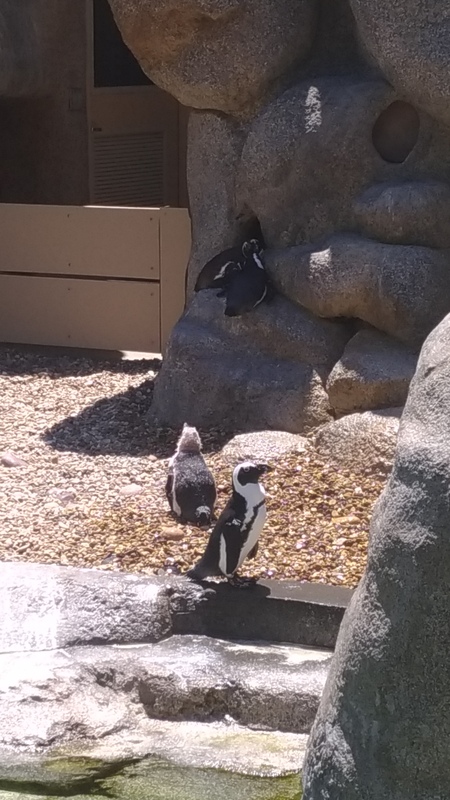 Make sure to stop off at the underwater display to view the swimming penguins on a hot summer day. 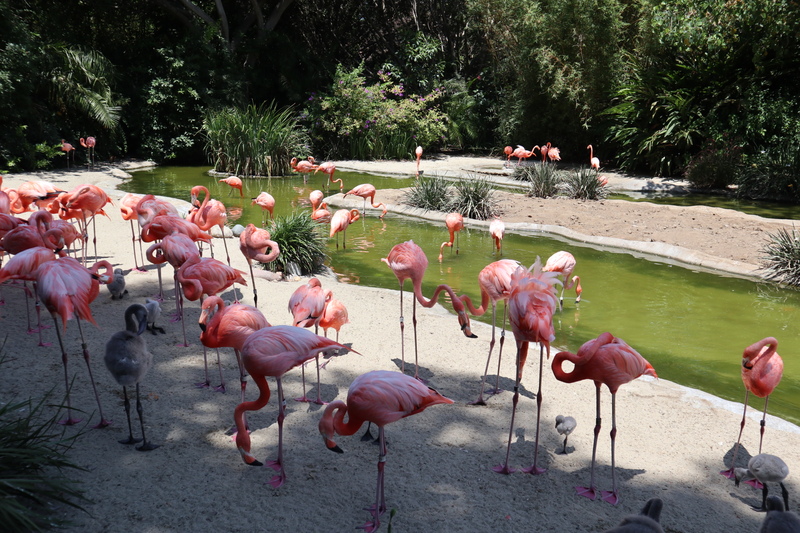 The Urban Jungle – located at the beginning of the zoo as you enter, showcases the beautiful pink flamingos! The pink flamingos are a sight to see up close, both adult large flamingos to small little newborn flamingos. Make sure to start with the guided tour bus, where you will be taken around the whole zoo so you can map out what you want to see without walking the whole park. The ride lasts about 30-35 minutes on a double decker bus. 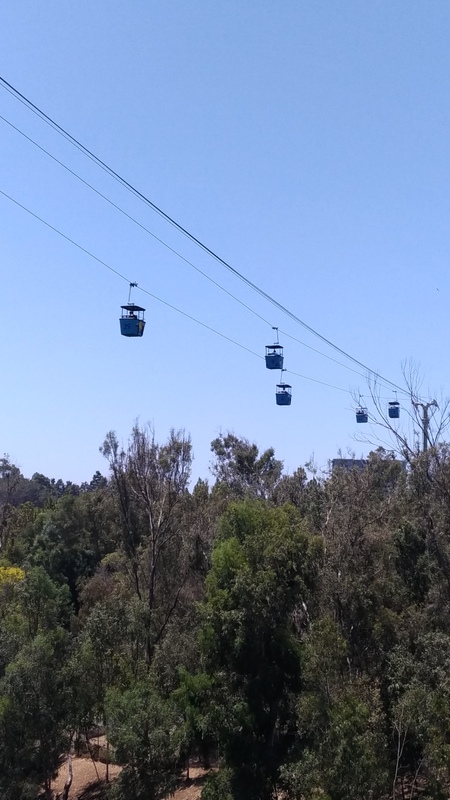 Afterwards, you can catch the aerial tram Skyfari up to the Polar Plunge, check out some polar bears, before moving down towards Panda Trek, Africa Rocks or other exhibits via the Kangaroo Bus hop-on hop-off service or just keep walking to find what you want to see. Bring lots of sunscreen, water, and snacks if you are visiting in the summer months – it is hot and mostly outdoor zoo – make sure to cover up if you burn easily. Make sure to plan a whole day should you have a family or 5-6 hours for an individual or couple of people. Wear comfortable shoes and dress accordingly – the zoo is huge in size so make sure to wear the right shoes – leave your high heels at home! In the summer months they also open til 9pm, so it’s a great way to come and escape the heat and see the animals out in the evening when it’s cooler out. Check out the Nighttime Zoo – on until September 3rd this year. Before or after your visit, if you want to see any of your favourite animals from the zoo, check out the live cams of the animals through the San Diego Zoo website. For more information on the San Diego Zoo, visit zoo.sandiegozoo.org.